I bought a 60's Kay tenor banjo for $40 on CraigsList (where else!!) a couple of years ago. Bought a nice hard case for $50. I figured I'd mess around with it some year. Or not. Yamaha Guitalele coming today!!! I'll start a thread on that soon. 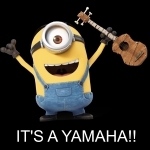 Was playing about with one of them, Yamaha Guitaleles in the guitar shop a couple of months ago, not to bad, good bit of fun, hope you like it. Now this is a great bit of Banjo playing, after hearing this who could not like, or want to learn the Banjo. at least I can mute ..nope, Not a Fender. Derick , although I play more clawhammer than three finger style, this guy was one of my favourite banjo players. While I saw him several times, I never actually met him. My wife, however once ran into him at a festival and asked him if he'd autograph a program for her husband (me). He said, "if you'll be my partner in the dance tent, I'd be glad to," so Maggie got to dance with John Hartford. I was really jealous; not that I wanted to dance with him, but I'd have loved to meet him. Derick, getting back to the original question about having a nylon string banjo. No idea, but, since you mentioned the volume and the harshness, my banjo playing friend has a mute for his that he uses when we play together. It doesn't dull the sound in a huge way but it does tone it down a bit. The cat doesn't run away so that must mean something. 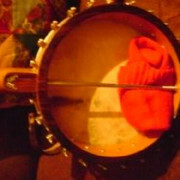 I mention it in case, like me, you didn't know there was such a thing as a banjo mute. All of my banjos have this addition. They slide close to the bridge for severe muting and towards the neck for less severe muting. This is one of my 5-string banjos. For really severe muting I will sometimes use alligator clips. In the late seventies I used to use clothespins, but they seemed to vibrate off in the middleof a song. These ones stay put. The banjo sounds almost like a Dobro with these clips on it. I find that red socks work best. 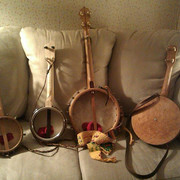 These are three banjoleles and a tenor banjo, all with nylon strings. Boodle Am ShakeI'm not sure how to capture and transfer videos from Facebook, but if you're a Facebook member you can watch this. I am out of the picture since it was taken by a girl who had a crush on one of the younger guys, so we old guys, Ted and I, were left out of the video. 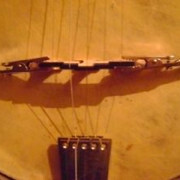 The banjo you hear is an old S.S. Stewart with nylon strings. 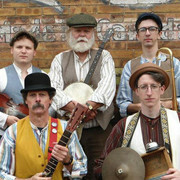 Here's the entire group (with a different washboard player). That's the old S.S.Stewart tenor banjer that you hear in the video. 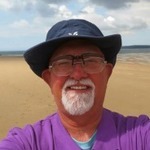 I taught school for thirty some odd years and when I retired, I took my desk bell with me. It now is fastened to the washboard. 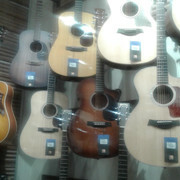 Yesterday did the tour of the two local guitar shops, not one Banjo in sight, five string or Tenor. Don't know if it's the time of the year, but they said they hadn't sold a guitar for over three weeks. I teach at the local L&M store every Wednesday and I slipped in to case the acoustic room today. Here are two six string banjos and a Deering Good Time. There was also an Epiphone open back that didn't make it into the photo. 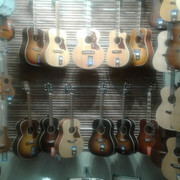 Here is the acoustic Gibson wall. 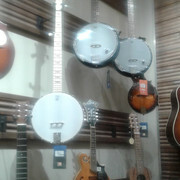 All them Gibson Guitars, and Banjos, in one place. Just maybe, it's a good job, that I don't live too close. If a student doesn't show up for a lesson, I spend the time in that room. 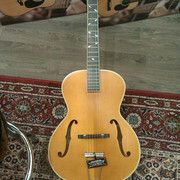 My current favourite is an Epiphone Masterbilt archtop. Playing guitar since: dinosaurs roamed the earth. That store would be dangerous place for me! I do like that Epi archtop, too! That store would be dangerous pace for me! I do like that Epi archtop, too! The other day, I was playing a Godin 5th Avenue archtop guitar, in the local guitar shop, I liked the look of the guitar, and wanted to really like the guitar, but I didn't like the tone/sound, if I had liked the sound I would have bought it.